Dr. Bower supervises naturopathic medicine students in Team Care at Bastyr Center for Natural Health, and is adjunct faculty at Bastyr University, where she teaches botanical medicine and gynecology classes. She also works in private practice in Seattle. Dr. Bower's clinical interests include women’s health and thyroid disorders. She has additional training in botanical medicine and craniosacral therapy. Dr. Bower's healing philosophy focuses on finding the root cause of your illness, not just looking at the symptoms. The approach to health is through gentle, non-invasive therapies that work toward supporting all of your body’s systems. Through this work, she will help you find the ideal state of wellness. 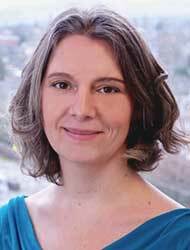 Dr. Bower completed a yearlong residency as a naturopathic physician at Bastyr Center for Natural Health, and she also has worked in private practice since 2012; in 2015, Dr. Bower was honored by her peers as one of Seattle Metropolitan magazine's "Top Docs." Dr. Bower has been a licensed massage practitioner since 2008, and she spent 10 years working in the Environmental Science field. Doctor of Naturopathic Medicine from Bastyr University in 2012. BS in environmental science from Antioch College, Yellow Springs, OH in 1996.